Tonicity Fit Blog Central: The Inflexibility Complex. Learn what Sarah at Tonicity Fit Personal Training Studio in West Chester has to say. The Inflexibility Complex. Learn what Sarah at Tonicity Fit Personal Training Studio in West Chester has to say. There are five major components of physical fitness: Muscular Strength, Muscular Endurance, Cardiorespiratory Fitness, Body Composition, and Flexibility. When a new prospect comes in to Tonicity Fit, the first thing that I always do is schedule a full assessment. The components of a physical assessment are: medical history, readiness to change, readiness to partake in a physical activity program, body composition, muscle strength and endurance, cardiorespiratory fitness, and flexibility. If I were asked which aspect of the assessment that I am most alarmed by, the answer would be cardiorespiratory health and FLEXIBILITY. For the purposes of this post, I am going to focus on flexibility. The number of people that I assess who are dealing with extreme inflexibility is alarming. So much so, that I feel it is important to take the time to discuss how this happens, why it is important to address, and what can be done to fix the issue. Why is this happening and why is it important? LIFE. The hustle and bustle of real life undoubtedly interferes with our ability to become flexible and maintain that flexibility at healthy levels. When I do an assessment on a client, I always make sure to ask about their hobbies and occupation. Knowing a person’s occupation is one of my most valuable tools in working with a client. As one example, these days a huge percentage of people that I meet with have some sort of desk job. The famous desk job has the potential to cause an overwhelming level of inflexibility. One specific area where I see issues among these clients are shoulders. 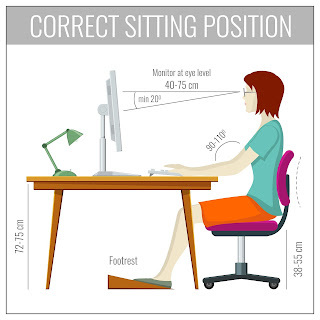 There are other issues that develop from the combination of excessive sitting and lack of stretching, but this area seem to be the most prominent. Shoulder inflexibility causes a cascade of issues into the upper body. Frequent desk sitting can cause what is known as the rolled shoulder. The rolled shoulder is actually the tightness and shortening of the pec minor, which pulls the head of the humerus forward. 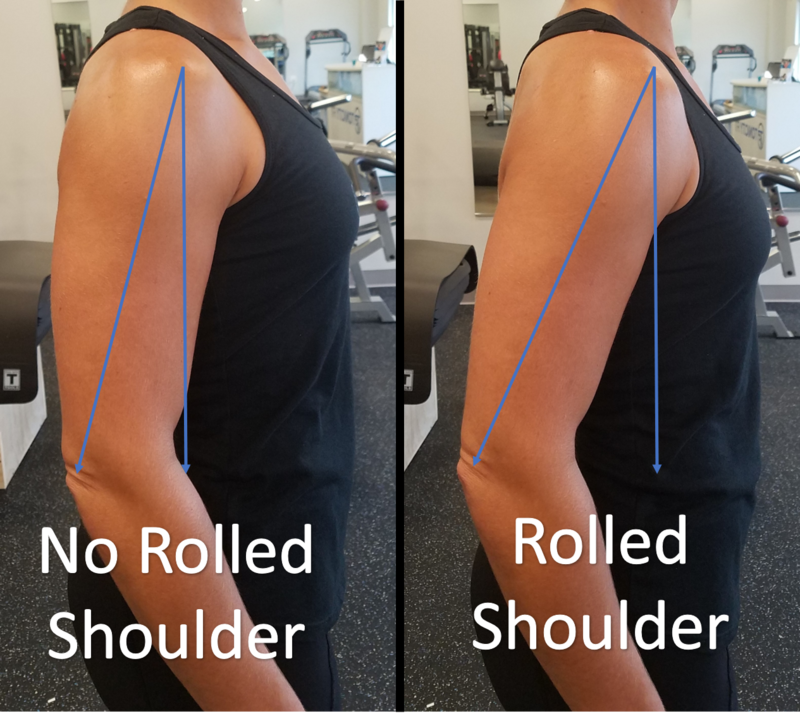 Not only does this cause decreased range of motion in the shoulder joint, it also can lead to excessive weakness and stretching in the upper back muscles. 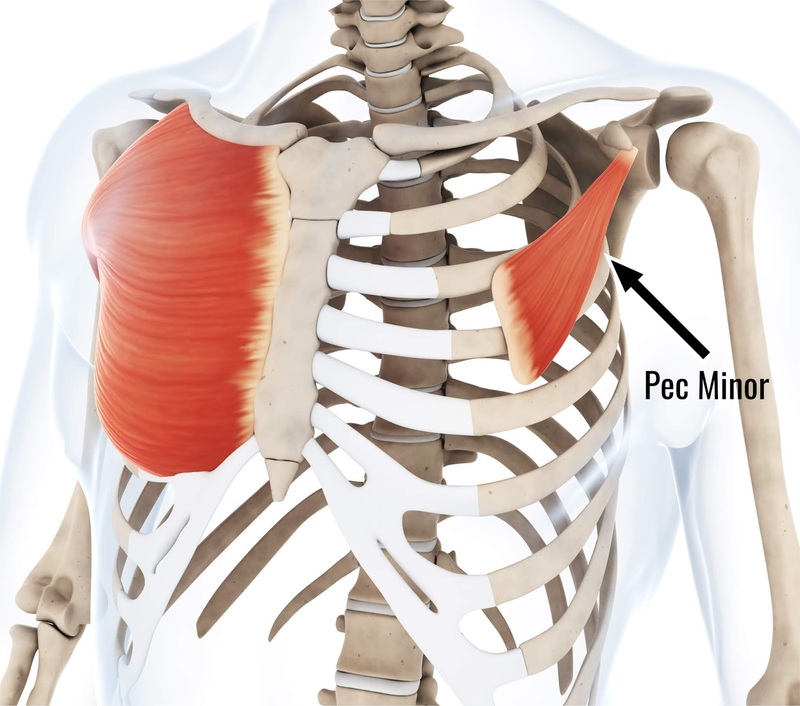 The Pectoralis minor (Pec minor) originates on the 3rd, 4th, and 5th rib and inserts onto the coracoid process of the scapula (shoulder blade). The main purpose of the Pec minor is to stabilize the scapula. 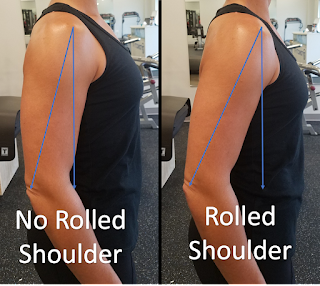 If this muscle is tight, or there is a weakness in the opposing muscle groups, the pec minor pull the shoulder girdle forward and down, causing the rolled shoulder. Another cause of inflexibility is repeated exercise training without moving joints through a full range of motion. When a joint is inflexible, the muscles become tight and shortened. The shortening of the muscle tissue surrounding the joint can significantly decrease range of motion. When regular exercise routines such as weight lifting are not accompanied by stretching, the muscles become tight, hence the potential decrease in range of motion of the joint. This is especially prominent when an exercise program is not well balanced. Decreased range of motion from tight joints leaves a significant risk for injury. Between the decreased range of motion and strength imbalances, joints are left vulnerable to strains and dislocations. Such imbalances need to be corrected through posture training, stretching, and balancing strength. Stretching tight muscles will significantly increase range of motion. The increased range of motion will also allow opposing muscle groups to build strength, and simultaneously improve posture. The ACSM recommends static flexibility training of 20-30 minutes per day, 2-3 days per week, holding each stretch for 10-30 seconds, accumulating each stretch to 30-60 total seconds. Exercise programs such as yoga and Pilates are beneficial for flexibility trainings, as they are structured to improve flexibility and strength simultaneously. It is always important to seek the advice of a medical professional prior to partaking in any exercise program. It is also advised that individuals work with a trained exercise professional on a program that is best for their personal flexibility needs. 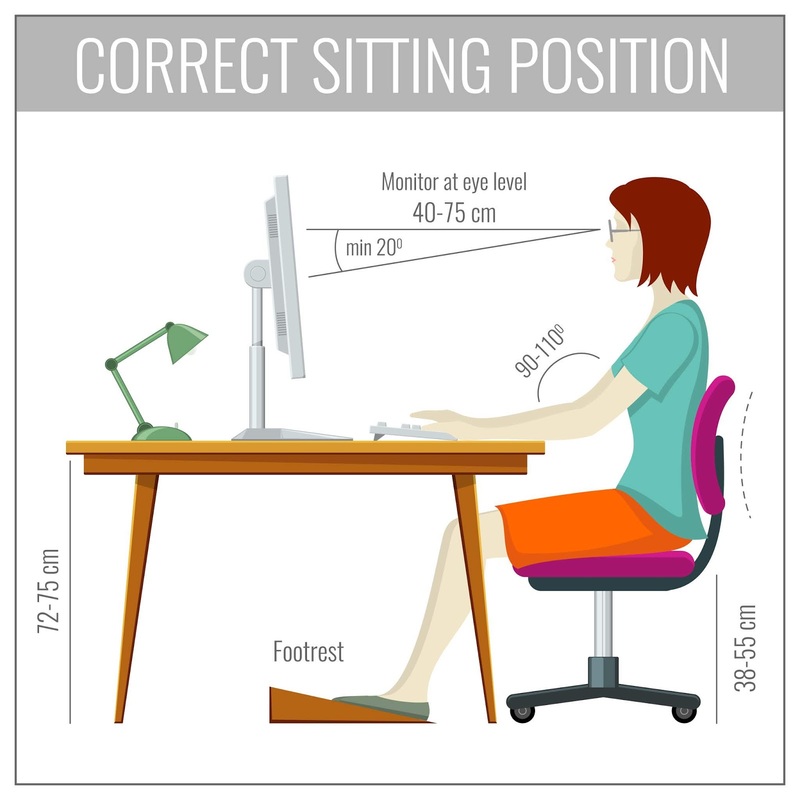 Posture training is also an important form of flexibility training. 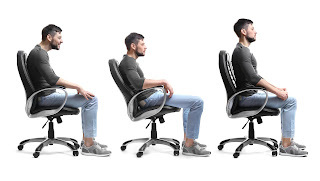 Subtle changes such as sitting up straighter, not leaning forward in chairs, and keeping weight evenly dispersed when standing are all important adjustments that can improve flexibility and reduce the risk of imbalance. The biggest confusion that I have observed is when to stretch. Should one stretch before or after a workout, or both? Well, that answer depends on several factors. Two currently researched factors are the goal of performance and risk for injury. If an individual is participating in an exercise program to improve strength and power performance, acute stretching can be counterproductive. When power and strength are the goal, maximally stretching muscle tissue before activity does affect optimal performance. It is important to note that the decrease in strength and power performance is an acute effect, and it is not necessarily related to long term performance. Performing flexibility training post workout could be the answer to combating this issue. There is also the question of using stretching as a warm up for athletics. This issue is beyond the scope of this blog post; however, I may address it in a future article. It is still up in the air whether pre-workout stretching causes increased risk for injury. It can be debated that stretching the muscle tissue pre-workout can leave the muscles overstretched and unprepared to perform at optimal levels, as noted above. It is suspected that the overstretch could cause the joint to be less responsive to necessary posture corrections; hence, causing injury. 1. Consult with a healthcare professional before exercising. 2. Follow the recommendations: 2-3 sessions per week, 30-60 seconds per stretch, at least 20-30 minutes per session. 5. Try to plan at least one session per week, before or after bed, where you are stretching major muscle groups. These sessions can even be broken up into morning and night if time becomes an issue.